RVB: 00:02 Hello everybody. My name Rik, Rik Van Bruggen, from Neo Technology. Here we are recording another podcast session. Today, we have a really interesting guest, all the way from Borås in Sweden, and it's one of our developers on the Neo4j engineering team. It's Oskar Hane. Hi Oskar. RVB: 00:21 Hey, good to have you on the podcast. Thanks for making the time. OH: 00:25 Thanks for having me. RVB: 00:27 It's great. 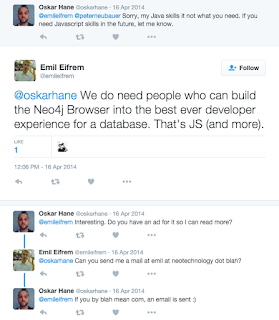 Oskar, one of the reasons I was really excited to get you on the podcast was because Neo4j has this wonderful front-end tool that I use a lot, everyone uses it a lot, called the Neo4j browser. I think you're one of the guys behind that, aren't you? OH: 00:46 Yes, since about one and a half years, I've been on that UX team, what we call it internally. RVB: 00:54 How did you get to Neo, who are you, where did you come from, how did you get to Neo? RVB: 01:21 Who is that guy? RVB: 02:16 Have you used Neo4j before or did you know about the product before, or how did you know about it? RVB: 02:53 Is a little bit more old-fashioned? OH: 02:55 Yeah, so I was completely blown away. I'm thinking, "Wow, I'd really like to work on this product," and I managed to get in. RVB: 03:07 And the rest is history, right? RVB: 03:10 Nowadays, it's you and one or two other people that work on that part of Neo4j, right? OH: 03:16 Yeah, currently, we're two. The other guy, Mark Peace sits in the London office, and in two weeks, another person is joining us, so it'll be great to have the three of us. RVB: 03:33 What do you think is so cool about Neo4j, in general, but maybe the browser, more specifically, why do you think it's such a cool product to work on, what makes it so nice? OH: 03:47 As you were talking a little bit that it's modern, in a way, compared to MySQL, and the browser is, you can visualize the data in a way that you're not able to visualize in a relational database, of course, an area that Neo4j or graph databases we have fixed relationships between nodes. RVB: 04:23 The graph data model, right? OH: 04:25 Yeah, exactly. So we have this graph visualisation in the Neo4j browser where we can run animations and have a gravity physics engine to display the data in a nice way. RVB: 04:44 I think one of the cool things about the browser, for me as a user, is that it combines so many nice perspectives. On the one hand, it's a visualisation tool, on the other hand, it's a query troubleshooting tool, on the other hand, I have a learning tool. There's so many nice things coming together, I think. I'm assuming that was intentional. OH: 05:09 Yeah, of course, it's sort of a platform for-- the target audience was from the beginning, at least, for developers who are writing apps for the Neo4j database, then we can use this Neo4j browser, as you say, they can see the data in many different ways. We can troubleshoot if we have any query program, so we can just run ad hoc queries to get interesting stuff, and you can learn the query language, Cypher, within the browser. RVB: 05:50 I have off the cuff type of question for you, what's your favorite feature, if you have any? It's probably the most recent one [chuckles], but what is one of your most-- the nicest thing about the browser? OH: 06:08 Wow, that's really a hard question. Even though it could be limited in how big graph you can do it at once, but I think the visualisation is actually my favorite because I'm basing that element that other database types that don't have, that makes us unique. OH: 06:54 I have that actually, I have that karaoke [laughter]. RVB: 06:59 I'm a fan of your work, Oskar, I really am. RVB: 07:05 One more thing, if you don't mind, where is this going? What does the future hold, both from the product in general, the browser, more specifically, and maybe the industry that we work in, any comments on that? OH: 07:23 I can talk for the browser at least that we-- we're talking about having it extensible in a way that somehow that you can write like from the plugins maybe for the browser, and load in an easy way as a user. I very much like to see that, at least, that if you want to visualize your data in a special way, maybe your own [row?] or table format that only you see, you could create a front-end plugin, so to speak, just have it that way. RVB: 08:10 So like an extension, but then part of the browser, so to speak, right? OH: 08:14 Yeah, something like that. But we're moving some of the content out of the browser so you can bring it back in. We're heading that way. RVB: 08:27 You also mentioned to me earlier that for future versions of Neo4j, the browser is not going to be like part of the same package as Neo4j, is that also something that's coming up then? OH: 08:37 Well, maybe, I'm not 100% sure where we are at the decisions yet, but what we know is that, at least, we have among the files, the repository for the browser out of the Neo4j main database, but mostly, having it as a dependency. 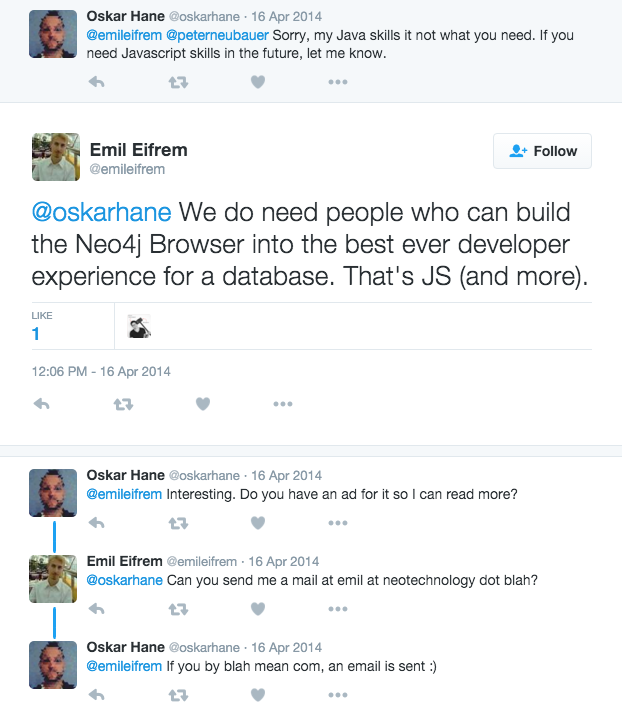 So when you download Neo4j, you get the browser inside it, just as you do now, but the code isn't mixed with the database code. RVB: 09:08 It's easier to pull it out if we want or need to do that, right? RVB: 09:13 Very cool. What about visualization, in general, is there-- there's so much stuff happening in that domain, graph visualization, it's a very hot topic, I think, how do you look at that? OH: 09:28 Yeah, it is, and it's super hard to show visualization that are huge which has functions and elements and relationships within it. I'm very impressed by many of the actors in the industry. RVB: 09:51 It very quickly becomes like hairball, doesn't it [chuckles]? OH: 09:56 It can hold your web browser as well. RVB: 10:00 Totally, there's some really cool visualization tools out there. We've been partnering with externally, so hopefully, that's complimentary, it should help us. OH: 10:13 Definitely, we're a small team. I think our visualisation is good for some use cases, but maybe not for some. RVB: 10:26 Well, very good. We'll wrap up the recording here, if you don't mind. We'd like to keep this podcast short and snappy. Thank you so much for coming online, Oskar, really appreciate it. RVB: 10:41 I'll look forward to seeing you maybe at GraphConnect Europe or some other occasion very soon. OH: 10:47 I definitely will be at GraphConnect Europe. RVB: 10:50 Fantastic. I'll look forward to seeing you there. Thank you. OH: 10:52 Likewise, thank you.